ELDR’s mission is to help baby boomers and their aging parents deal with the challenges and opportunities of aging by providing the most useful, thought-provoking and trusted information available anywhere. Yoga postures promote healthy aging by lengthening the spine, opening our posture and moving each joint in the body through its full range of movement. Think you’re too old or stiff for downward dog? Not with the use of blocks, bolsters, and other handy aids. Here’s why you should learn the ropes. 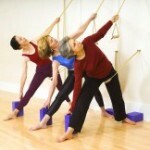 Eliminate stiffness, develop spinal agility, and slow down some signs of aging. Want to stay healthy and independent well into old age? Yoga can help keep your bones in good shape for a lifetime. If you have osteoporosis, read up on these guidelines before taking a yoga class. Yoga standing poses safely increase range of motion in all the joints. If you have arthritis, yoga could be just what the doctor ordered. 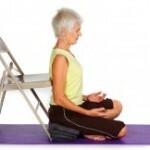 Have a seat and learn how yoga can help relieve pain and improve your flexibility.